Did you know that you can get a big big bag full of stuffed animals for $2.50 at your local Goodwill store? These make great toys for dogs, who chew them up anyway. Stop paying $10 per toy at Petsmart! Getsmart and shop for your doggie toys at Goodwill! Flint likes his new pink stuffed animal. This is one of the ones I had to throw out quickly, though, because it had foam beads and not stuffing inside of it. I bought two bags today, and then sorted them into "stuffed toys only" and "toys with things like batteries in them." I got about one full bag of each, and donated the bag with the non-suitable toys back immediately. $5 for about 10 new stuffed animals? Bargain city! 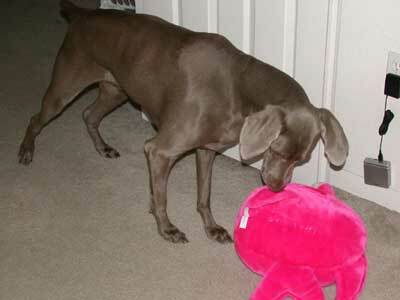 10 Responses to "Cheap Dog Toys @ Goodwill"
Great idea! I will have to get my wife to start doing this. She is one to buy the $10 toys at Petsmart. She probably won't want to get them at the goodwill. Because they aren't fashionable enough or something. Is that a GBA SP I see there hanging on the wall? Just got mine last weekend. It's great! Too bad my two dogs destroy anything with stuffing. The only thing our dogs get to enjoy is rope toys and hard nylabones. My dog destroys stuffed things too (takes him a week or sometimes more), which is why paying about 50 cents per stuffed thing is so nice. If he doesn't have stuffed, softer toys, he chews sweaters or towels. Well, one of each before I realized this. A week or more? Luckly you, it takes mine about a half hour to get to the "sweet spot" of a stuffed toy, perhaps it because they are always fighting over who gets to enjoy it. Chalk it up to sibling rivalry I guess. It takes just about as long for them to munch down a rawhide bone. We usually have to take them away because one of them will usually get ill (from eating the entire thing), and yak on the floor. The older dog (Lexi) used to chew on the trim on the walls and the banister before we got her a playmate (Rory). Now she is the good one, whilst Rory destroys shoes (four pairs so far), pictures, shirts, etc. At this rate, we'll have to get a pack to settle them all down. What about all the kids who's parents went to Goodwill to buy them stuffed animals and then couldn't find any? Don't get me wrong... I'm all for ideas to bypass the commercial juggernaut, just don't get overzealous. And I'm sure everybody here is intelligent enough to find other alternatives as well. And puhleaze, kids don't need toys with batteries, they need toys they can use their imaginations with. My wife and I haven't purchased any new toys for our weim Gitte in almost a month because she recently set a personal record for stuffed animal destruction. One night Mary gave her a cute little stuffed hedgehog and then fell asleep on the couch watching TV while I was back in my office. I came out to see what they were up to and discovered that Gitte had completely disemboweled her new toy while Mary was sleeping. Stuffing was everywhere and the hedgehog's stomach was almost entirely ripped out. Luckily at the time we still had a pretty good supply of slightly more durable toys; now that we're running low again and Gitte's chewing up gardening tool handles (today's incident :-P) we're definitely going to have to check out Goodwill. I found a toy - a Lamaze toy - all Lamaze toys are unconditionally guaranteed for life at a online Lamaze Toys shop. I will have to buy one for doghter couse she chews toys up faster then a dog anyway. WOW! Good idea. My Lab chews through my kid's stuffed toys like crazy! But she loves them too. She always has a stuffed "baby" in her mouth...carries it everywhere!